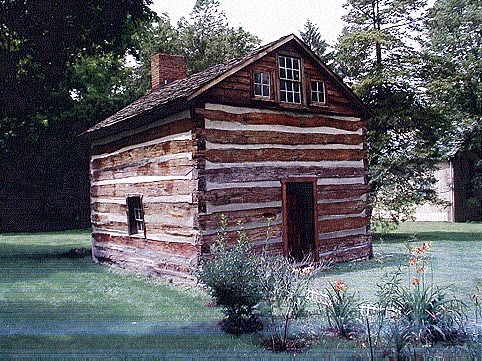 Johann Jacob COY Log Cabin(1802)-NAT'L Landmark!!! 200 years old and still standing. Beavercreek Historcial Society of Greene County has just named the Jacob COY Log Cabin a Historical Landmark. This fact is stated in Log*By*Log-Hist.publication, July 2001,Vol.10,Num.7.The committe chose 12 structures or locations within Beavercreek Township lines, as well as recommending 5 more to landmark status.Plaques and recognition are due to be pesented during their Heritage days held Sept.14-16,2001. My brother David,and my father will be there for the ceremony to see the offical recoginition of the cabin. I also sent a letter asking the Landmark committee to consider the 2 story home of his son,John Coy(b)1783.John's home was built in 1827 and sits on the backside of Mt.Zion on the hillside away from foot traffic. 08/13/01-Bob Zimmer,Chairman of the Landmark committe called me at work,and told me he submitted this stucture to be named a Landmark in 2002.This was from my inquiries, and letter.I could tell in his voice, this is a labor of LOVE, and he was happy the members of the family actually were thrilled with the recognition of their Homesteads. I was also told that during the Oct.2001-1st Annual Landmark Tour of sites,Jacob's cabin of 1802 and the 2 story Springhouse that still has running water will be part of the tour.I would love for that building to be nomintated and designated as a landmark too. Just a side note, the name of COY appears even in their Aug.Vol.10 Num.8 2001 publication of Log*By*Log ,from every generation making some kind of mark on the community. Jacob Coy Ancestors are still HERE in 2001,making their mark on History. There is a photo on pg.104 of the Beavercreek Chronicles Historical Book.The entire Historical committe is pictured in front of the Cabin,(a COY is part of the committe).The current owner's Mr. and Mrs.Hagenbuch are included.He and his wife purchased our cabin in 1946 and had it moved onto their land for historical presevation. J.Jacob Coy's 2 story log cabin was one the 1st log holmes built in the township.I also found supporting documents that his log cabin was used for the 1st schoolhouse in the township, as well as his barn held the 1st Reformed German Church services in the area for the congregation of people that travled with him to settle the Beavercreek Twp. Area. By all account of the materials I have found about J.Jacob COY (b)1739 and his decendants to be part of the very backbone of the setteling of the Dayton (Beavercreek Twp. )Ohio area from 1801-forward. This Greene County information states he ,a s well as his sons' were decons in the Reformed Church that they were instramental in establishing in the area. 1803-Jacob and Adam Coy were listed as a few of the 1st voters within Bearvercreek Township. The journey would have taken at least 4 days and was no easy task since this was such a rugged Wilderness at this time. 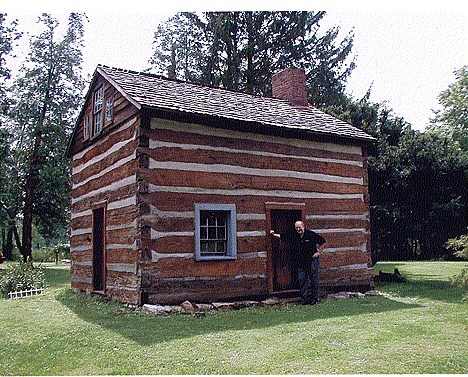 Eugene Ellsworth Coy (8th generation COY)Standing next to the cabin of J.Jacob Coy cabin.The cabin was built in 1802 in Beavercreek Twp.,Greene Cty.Ohio. The cabin is almost 200 years old,a tribute to the solid craftsmanship by our Pioneering for fathers. Jacob's 1st Beavercreek Cabin sits on the property of Mr.and Mrs. Hagenbuch. This is situated in their front yard. So as any visitor comes to see them, they park out in front near the cabin. Mrs.Hagenbuch an Antique Dealer, carefully furnished the cabin with furniture and utensils that represent the flavor of the early 1800's.She paid great attention to detail, and has given much love to maintain integrity of the cabin.For many years the cabin was used as a personal museum and antique shop by the Hagenbuchs. 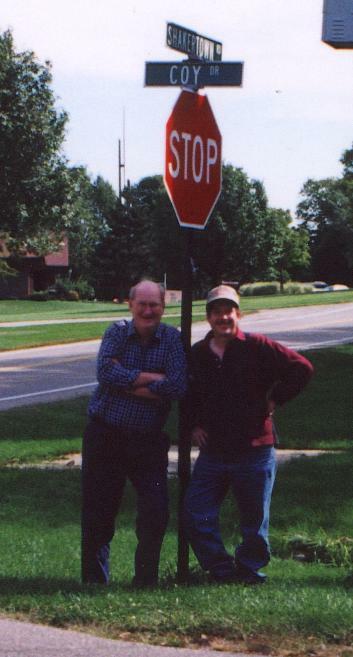 The Hagenbuch family themselves have a long lineage in Beavercreek Twp.,so I find it very apppropriate that they continue to enjoy and love our FAMILY Homstead that still stands near it's original location. This is my open THANKS to this fine couple. COY Homestead-(pg.178-BC Chronicles)The second home was built in 1827, a large federal style,2 story log home. The second home was 24x36 foot structure with 8 rooms.It had 2 fireplaces,one in the "great room" and the other in the dinning area. The house was built over limestone blocks over a root celler. The home had a high large porch 7ft 6in high, and ran the length of the front of the home. Out front their was a barn for the livestock,a hen house,a smokehouse,a springhouse to keep milk cool, and of course a "one seater" outhouse. The last owner was Mrs. Martha Dietz Coy (1843-1986) ,who raised son Roy L.Coy in this home. This home was saved from demoltion in 1989, when owner Roger Coy donated it to the Beavercreek Township. The trustees of Beavercreek had it moved to the North side of the Beaver United Church of Christ on Dayton-Xenia Road in the area of Phillips Park.It rests on the hillside overlooking the Beavercreek Wetlands area, and is currently being used as office space for the Beavercreek Wetlands Assoc. My brother David,and my Aunt Marilyn COY, happened to have made a trip to area during this time frame,and knew of this undertaking going on. They said telephone poles, and very heavy equipement were needed to move this Log home in it's entirety. Through out the book I have bought I can see that any land,building or items from the early Pioneer days are to be saved for everyone's enjoyment.Their committes seem to be focused on trully keeping the past alive so that we might keep our connections with our ancestors. 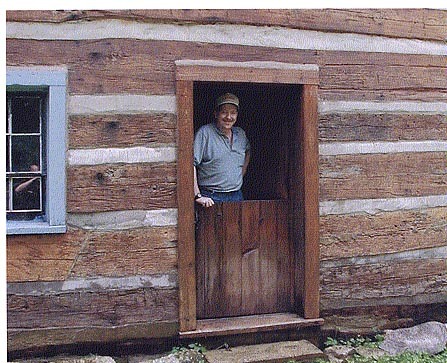 (photo below)David Ellsworth Coy-(9th generation)standing inside the 2 story cabin of J.Jacob Coy our ancestor. 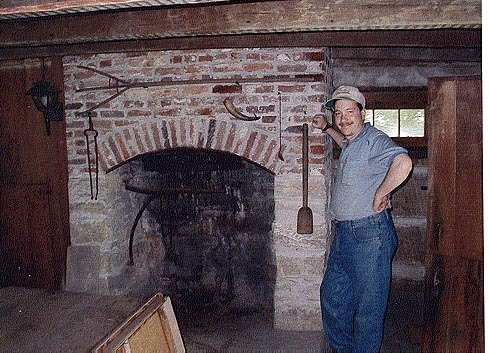 This fireplace would have been the center of the home.I can imagine cornbread being baked in a cast iron skillet,or potatoes being roasted still in their skins ,and placed in the coals to cook.Meat and vegatbles would have been cooked in a large pot that hung on the arm that swings over the fire. (Photo Below)David,my brother (9th generation) standing at the Dutch doors. David standing in the door frame of the Dutch door.Notice that the door frame is low, one would probably have to duck to enter the home. The Dutch door was represenitve of it's architecure for the time.When the rope on the door was let out, a person could enter from the outside,if the rope was pulled inside, you could not open this type of door from the outside.This was a very secure type of system. 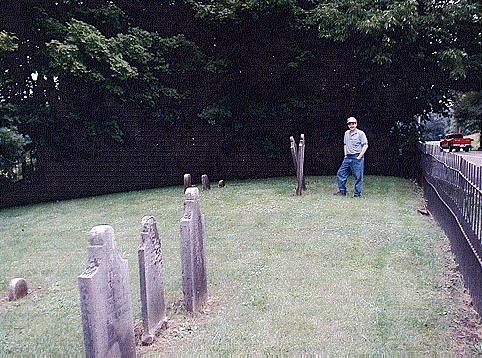 (below)COY FAMILY CEMETERY-(1st Gravesite in Beavercreek)David standing in front of the headstone of J.Jacob Coy (b)7/27/1739-Germany (d)12/11/1832.Jacob's wife Susannah is just to the left,however her headstone is not as legiable,and her maiden name would not have been inscribed. According to Greene Cty.,the COY Family was described as the the 1st Cemetry in the area of Beavercreek (pg.585-R.S.Dills)on the corner of Jacob's farm,west of Alpha where the Shakerstown and Zimmermanville Road's cross. There are only about 10 headstones in the cemetery,however David states that the area could hold as many as 60-70 gravesites,however they are not marked.Somehow our progenitor J.Jacob COY and wife Susannah have very large marble stones,while the few others are very small. Daughter Catherine Coy (b)1778, married Andrew Smeltzer,(d)1802 would have been the 1st COY buried in this family resting place. Son John Coy (b)6/28/1783- (d)1732 is buried in unmarked gravesite,per an inscription on his wife Mary "Polly" Jones headstone when she dies in williams Cty.Ohio many years later. David had brought another interseting piece of information up for discussion when he recorded J.Jacob Coy's actual birthdate as July 27,1739. All of the headstones were inscribed with a persons birth in terms of how many years,months and days old a person was and then the actual date of death. Jacob's headstone reads "93 years,7 months,25 days and then his death date. So this fact was in debate,could the actual birthdate be off a bit. David stated that when Jacob was born in the old country, they were using the Gregorian calander. Then sometime in the early 1800's the Brittish Empire adopted the Julian calander.So David's calulations would only be off 10 day's one way or the other,depending if 2 different calenders were used during Jacob's life, and how it was recorded at his death. *I also wondered if this was German way of putting your date of birth on your headstone,I was informed it was a Mid-Western,American format. The format was still used wehn I found several records for Jacob's decendants 3 generations later in Ohio. Book-History of Greene County by R.S.Dills-Dayton Ohio Odell Publishers,1881. The preface from G.F.Robinson even travled to the townships to collect data during the late 1890-1900 time frame.